Join JCJ for a unique event – a combined tea and cheese tasting on Wednesday 24th June. 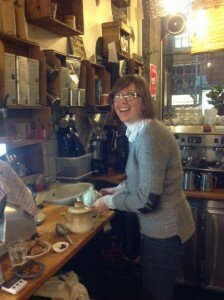 It will be hosted by tea connoisseur Scarlett Killaly at her new cafe Porcelain in Carlton. (Scarlett is shown here as co-host of our 2013 tea tasting). We’re raising funds to send Stephen Bygrave, CEO of Beyond Zero Emissions to Sri Lanka in September to promote 100% renewables. Come and help us make this happen. For more about Stephen’s proposed trip and what it will achieve, go to our 100% renewables page. He will be holding meetings with environmental experts, NGOs, government and industry leaders to empower them to bring about alternatives to coal. Numbers limited to 17, so RSVP asap: Facebook or email. Payment in advance is required, via Paypal, bank transfer or cheque. Please visit the Donate page for details. Please ensure your payment reference has your name and Porcelain. Please help us promote the event. Here is our JCJ Porcelain flyer 3-to-page.